An early start is called for today. You will be driving over 300 km after all. But there's no call for alarm: over two thirds of the route is on the well-developed National Road. You can usually make swift progress there. Leave the National Road at Stalida, and then wind your way uphill on a well-made road with switchbacks. Far beneath you lie Crete's bustling, mass tourist resorts of Limenas, Chersonissou and Malia. Then you will reach the first small plain, where a great deal of wine is cultivated. You can finally enjoy a well-deserved coffee or herbal tea on the photogenic village square of Mochos with its many mulberry trees. The small village church stands right on the village square. There on the iconostasis hangs an icon with a motif that is rarely depicted: the Akathist Hymn. The Akathist is an early Christian hymn to the Holy Mother, it refers to the life of the Virgin Mary and praises her in ornate language. The hymn consists of 24 stanzas, each starting with a different letter down through the Greek-Byzantine alphabet. The icon is therefore divided into 24 image panels. Test yourself and try to correctly name all 24 letters! The variety of images in 'O Skoteianos' kafenion is much easier to understand (and also to photograph). It is situated to the right of the main road, approximately 100 m from the Platia in the direction of Lassithi. The owner's son, an active police officer on the mainland, has artistically painted with chairs and numerous wooden panels on the walls with portraits of Greek heroes, both legendary and historical. Like icons, they are inscribed and anyone who can read a little Greek will quickly understand who or what is depicted. A little further on, a small detour leads you away from the most direct route and takes you into the tranquil village of Krasi, situated at 600 m above sea level. The plane trees growing here on the village square are held to be the oldest in Crete. A Venetian fountain brings water to the square. As you might imagine, Crete being Crete, a coffee house has set out tables and chairs underneath the trees. Incidentally, if you place the emphasis on the wrong syllable of "Krasi", the name of the village, it means "wine". So remember to place the emphasis on the first syllable! Panagia Kera i Kardiotissa Monastery is well signposted on the main road, right before the village of Kera at 560 m above sea level. For years it has been tastefully restored with the aid of donations (visitors are asked for donations of 2 euros/person instead of entry tickets). The inner courtyard has become a small garden paradise. The complex dates back to the 18th century, and the church dates back as early as the 14th century. Surrounded by bars in the courtyard of the monastery there is small column, made from a single stone. A highly venerated Marian icon with suitably rich ornamentation hangs on the iconostasis in the church together with a piece of a crudely linked iron chain. A highly embellished legend surrounds the column, icon and chain: because of its miraculous works, the Turks stole the icon and brought it back to Istanbul as a help in times of need. But the icon did not want to be taken there, and in the night, it mysteriously returned to the monastery, upon which the Turks tried a second time. Again, the icon promptly returned home. So then the Muslims stole the icon a third time, except this time they bound it to a column in Istanbul with a chain. However, that didn't prevent the icon from escaping. This time it hovered back to Kera together with the column and the chain. From Kera, the road rises sharply up to a mountain pass, which you can recognise for miles thanks to the bases of its many stone windmills. On this street, one Cretan realised his lifelong dream of creating his own private 'Museum of Mankind'. Everything you see here was conceived of and financed personally by this former customs official, who built and developed the museum with his own two hands over many years. When Giorgos has time - and he usually does - he's happy to personally guide visitors through his imaginative kingdom. For Giórgos Petrákis, the first man on the moon was the main event in his life. He was only 16 years old in 1969, as Neil Armstrong first set foot on the Earth's natural satellite, on the 21st of July at 4:46 am, Greek time. His grandfather woke him up especially, so that he could follow events on their black and white TV screen. At that moment, it was suddenly clear to Giórgos, 'This isn't one individual conquering space for himself - all of us , together, are making this giant leap in the history of mankind.' The pursuit of human history became his hobby. To enter his open-air museum, you pass through a labyrinthine passageway. Statues of a Neanderthal and the astronaut Yuri Gagarin are placed at the beginning. At the end, a petrified tree trunk from the island of Lesbos is on display; it is 180 million years old. Then the depiction of the different stages of human development begins, from cave men in the Palaeolithic Age, all the way to the development of settlements and the creation of the Greek pantheon. All twelve Olympians are present as statues. With this, Giórgos considers the first stage of human development complete. A particular indicator of our further development is the increasing average life expectancy from era to era: it is stated for each epoch on information panels, which are always kept very short. Now you are standing in front of a small chapel, which Giórgos took about five months to build. 'And then came Jesus Christ', states a panel in six languages. And by these same means, Giórgos has gone so far as to create his own museum. As of 2016, it now also includes a horse, which naturally played a crucial role in human history. It is life size, but made of granite. If you want, you can swing yourself onto its back and have a photograph taken with a lance in your hand, in the style of Alexander the Great. A long line of old stone windmills stand on this 900 m high mountain pass in the south of the Lassithi Plateau, most of them sadly just ruins. Grain was milled here right into the post-war period. Today, you will find a large taverna here with a panoramic terrace, from which you have the whole plateau before you. They serve delicious roast pork from the wood-fired stove every day from 12:30. The oven is to the left of the entrance to the taverna, and emanates a heavenly aroma. Potatoes from the Lassithi plain are served with your meat. The plain is on average 840 m above sea level, 8-10 km long and up to 5 km wide. The peaks of the Dikti Mountains (Dikti Ori) shield you from the outside world, reaching up to 2148 m high. The plain consists of a fruitful alluvial plain, which is partially under water in winter. The masses of water from rain and melted snow flow down underground in the north-west of the plain, next to the village of Kato Metochi, and bestow the farmers up here with more than enough ground water all year round, lying 15-25 m below the surface. These days, it is pumped up to the surface to water the fields using motor pumps from about the middle of June. Old postcards and photos, as well as reconstructed windmills, which are mostly situated close to tavernas, show what made this plateau unique in the past: it resembled an ocean of windmills set with canvas sails. Perhaps in light of rising energy costs their time will come again soon... Farmers mostly plant and harvest potatoes and apples here, but they grow other kinds of fruit and vegetables as well. Organic potatoes are becoming popular, because they fetch a higher price. The farmhouses are spread across a total of 21 villages, almost all of which are settled along the edge of the plain, so that none of the precious farmland is wasted. It takes less than two minutes to drive down from the mountain pass to the plain. Down here, it's best to turn right and make the circuit of the plain anti-clockwise. Straightaway on your right, you'll see the small Vidanis Monastery which has been elaborately restored. The monastery has a tiny natural history museum, which is really only of interest to school groups. Continue through tiny villages along the edge of this fruitful plain until you reach Psychro, the main destination of all tour buses. A dead-end road takes you uphill ending in a car park with several tavernas. Donkeys and mules await those who would like to ride (10 euros one way), but you can also walk up in 15-20 minutes. The way takes you up to the dripstone cave, Dikteon Andron, which is closely connected to Greek mythology. The entrance to the cave is 1025 m above sea level. Walkways take you into the cave, which is illuminated with electric light, down through a wonderland of stalagmites and stalactites. The cave served ritual purposes from the Early Minoan period, all the way through to late antiquity (approximately from 2500 B.C. - 400 A.D.). Archaeologists found small altars and numerous votive offerings in the cave and at its entrance. Today, most of them are on display in the Ashmolean Museum in Oxford, UK. No objects of ritual value remain in the cave. New finds are brought to the Archaeological Museum of Agios Nikolaos. According to Greek mythology, Zeus was born of his mother Rhea in a cave on Crete, or at least taken directly there as a new born, because his father Cronus had the unpleasant quirk of devouring all of his children as soon as they were born. Zeus was to escape this fate. Rhea deceived Cronus, handing him a stone instead, disguised in swaddling clothes, after she had given birth. She placed Zeus in the care of the goat Amaltheia, who nourished and raised him in the cave. Nine demons, the Kouretes, would clash their speers against their shields whenever the infant god cried, so that his evil father Cronus didn't hear his cries. As a youth, the young Zeus then left the cave and set about killing his father and taking his place on the highest throne in the Greek pantheon. But, as is often the case in myths, these are just terrifying tall tales. That's why it's also possible that another cave, Ideon Andron, in the Psiloritis Mountains near Anogia was regarded as the Cave of Zeus in antiquity. There's also a compromise: Zeus was born by the Psiloritis but then raised here on the Lassithi Plateau. It's up to you what you choose to believe! You can take a peaceful break in the large village up on the plateau, but you can also visit two small village museums, set side by side. The Folklore Museum in an old farmhouse vividly depicts how people lived here right into the post-war period. You can also pick up the key there for the Venizelos Museum, diagonally opposite. Some historical photos and documents here seek to inform visitors about the life of the great Cretan statesman and poet, Nikos Katzantzakis. Lastly, leave the plateau behind via the Ambelos Afin mountain pass. After Kera, follow the road that takes you through the villages of Gonies, Avdou and Potamies, down to the coastal plain. 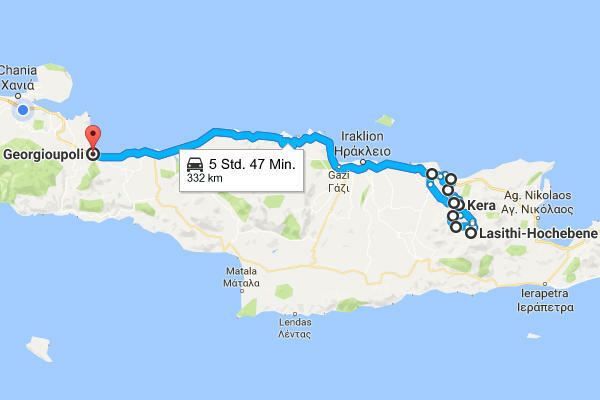 Before re-joining the National Road to Georgioupolis, you can take another pleasant break in a taverna on the beautifully designed village square of the inland village of Chersonissos.